Locational Advantage : Choki Dhani is situated on main Tonk Highway. Chokhi Dhani is an ethnic village resort with a blend of rustic environment and modern amenities making it favorite destination in Pink City, Jaipur. Chokhi Dhani Resort literally meaning the "Fine Hamlet". The Resort, with its ambience of a typical Rajasthani village is also fully equipped to handle all your conference needs. The spacious huts, away from the hubbub of urban life offer you unmatched serenity with every modern amenity & comfort while you bask in the splendour of rich Rajasthani culture. Comfort is synonymous with the stay at Chokhi Dhani. 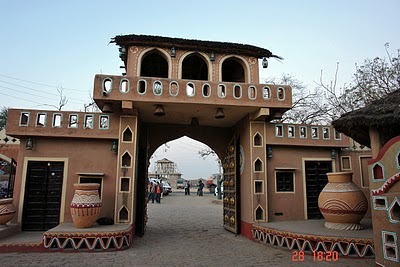 It has 65 cottages, 8 Haveli Suits, 2 Conferences Halls, Chaupal, Chandi Mahal Bar and Bindola Multi-cuisine restaurant. Cottages: Chokhi Dhani has 65 luxury AC cottages. Richly and tastefully adorned with ethnic decor, they offer all comforts of a 5 Star hotel.